Philadelphia has opened a public high school where students work on wireless laptops, teachers eschew traditional subjects for real-world topics and parents can track their child's work on the Internet. Called "The School of the Future" and created with help from software giant Microsoft, it is believed to be the first in the world to combine innovative teaching methods with the latest technology, all housed in an environmentally friendly building. 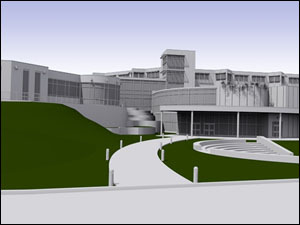 The school, which cost the school district $63 million to build, is free and has no entrance exams. 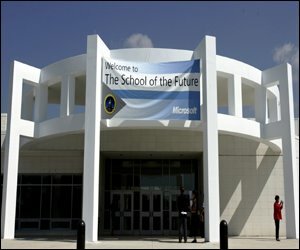 The idea for the school was born in September 2003, when Philadelphia public school district CEO Paul Valis met with Microsoft executives. The two parties discussed working together on formulating the high-tech school of the future so that it could be a template for other areas around the country. The school came to fruition this year. Student still sit in classrooms, but lessons rely heavily on information found on the Internet and on interactive software. Students will be allowed to learn at their own pace. Homework is done on computer and sent to the teacher for grading and parents can access the school's network to read teacher feedback on their child's progress. Students -- who are called "learners" -- use smart cards to register attendance. classroom furniture is on wheels to allow for group work in varying configurations. Each student has been provided a Gateway laptop computer with wireless Internet access. And every classroom has interactive Whiteboards - large, electronic writing surfaces that communicate with computers and take the place of old-fashioned blackboards. The students command their own wireless laptops for school and home use and are connected to the school's centralized high-tech network for learning and administration. Teachers, or "educators," rather than using blackboards, have interactive "smart boards" that allow teachers to zoom in and out, write or draw, and even link to the Internet. Check this out guys....These are the pics of the forthcoming products of Apple like the new Applee iPods and the Mac Books......Enjoy!!! A YouTube movie about a little boy (with a face like a man) doing some dancing moves. Take a virtual tour of the Bill Gates Mansion where he stays with his family. The Bill Gates family lives in the exclusive suburb of Medina, Washington, in a huge earth-sheltered home in the side of a hill overlooking Lake Washington. 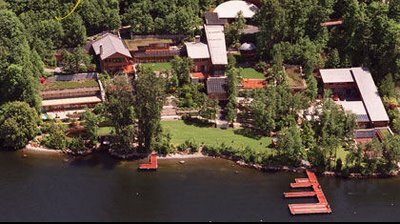 Billionaire Bill Gates home is a very modern 21st century house in the "Pacific lodge" style, with advanced electronic systems everywhere. In one respect though it is more like an 18th or 19th century mansion: it has a large private library with a domed reading room. While it does have a classic flavour, the home has many unique qualities. Lights would automatically come on when you came home. Speakers would be hidden beneath the wallpaper to allow music to follow you from room to room. Portable touch pads would control everything from the TV sets to the temperature and the lights, which would brighten or dim to fit the occasion or to match the outdoor light. 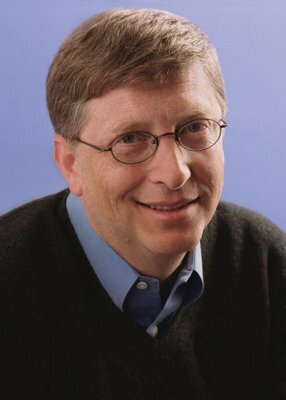 Visitors to Bill Gates House are surveyed and given a microchip upon entrance. This small chip sends signals throughout the house, and a given room's temperature and other conditions will change according to preset user preferences. According to King County public records, as of 2002, the total assessed value of the property (land and house) is $113 million, and the annual property tax is just over $1 million. According to the National Association of Home Builders, the median American house size is slightly more than 2,000 square feet. Microsoft founder William Gates III house is more than 30 times that size. I have found a new software specially for you and your sluggish internet. Its called the TCP Optimizer. Download the TCP Optimizer and then read this which will help you to boost up your internet speed. If you have downloaded this and still the speed of your internet is not increasing, then the last and the best option is Google Web Accelerator. Just download this and then restar the PC and enjoy the swiftness of your internet. This year's British Motorshow is by far the best in recent memory. Following awkward shows at Birmingham and Earl's Court, the Excel centre at London's Docklands lends itself extremely well to this new role. The unique waterside venue, coupled with the UK's exceptional weather have combined to make this one of the best motor show venues worldwide. You undisciplined sliver of wild belly-button fluff. 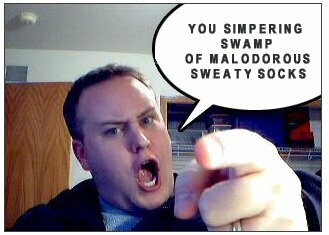 You lost eruption of hairy lizard droppings. You congealed accumulation of fresh cooking fat. May emergency medical technicians eat each other's belly-button fluff on your lawn. Million a DAY and US$7.8 Billion a YEAR! with US$5 Million for his pocket money. 5. Michael Jordan is the highest paid athlete in US. If he doesn't drink and eat, and keeps up his annual income i.e. rich as Bill Gates is now. of 713 BOEING 747 planes to transport all the money. finish all his money before he can go to heaven. Create your own 3D I.D. Meez are 3D identities you can create. Face, hairstyle, clothes, piercings, backgrounds, everything. And you can use your Meez everywhere. On IM, communities, weblogs, email, everywhere! 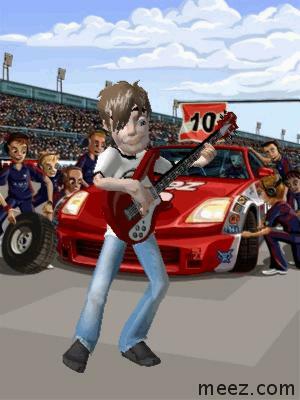 You can even animate your Meez. Here's a Meez I created. 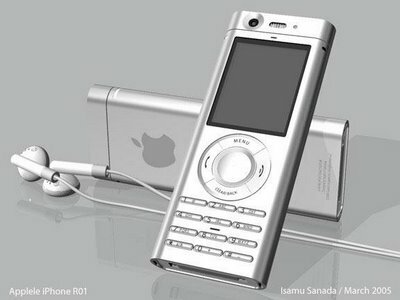 A thinner design. Five stylish colors. A brighter display. Up to 24 hours of battery life. Just about the only thing that hasn’t changed is the name. 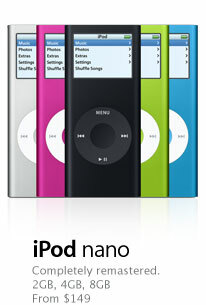 In 2GB, 4GB, and 8GB models starting at $149, iPod nano puts up to 2,000 songs in your pocket. Besides all these, it has got an extended battery life of 24 hours. So, fly around the world with this small music store in your hand. 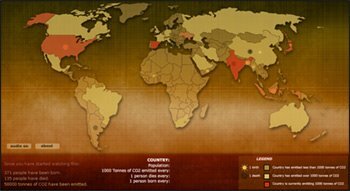 Breathing Earth is a visual, real-time simulation of the CO2 emission rates, birth rates and death rates of every country in the world. Hey ppl, do you have virus in your phone? Is your phone not working well? Do you have any problems with your phone? Well, then I have a solution for your problems. 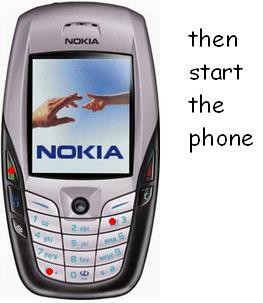 All the mobile users having Nokia Symbian based phone can now format their phone at their home. You have to follow 4 simple steps and your phone will be formatted. Dont worry, your memory card will not be formatted. So, you can restore the backup which you have taken prior to formatting. This is kinda virtual GPS system and you can get it free from Loki. 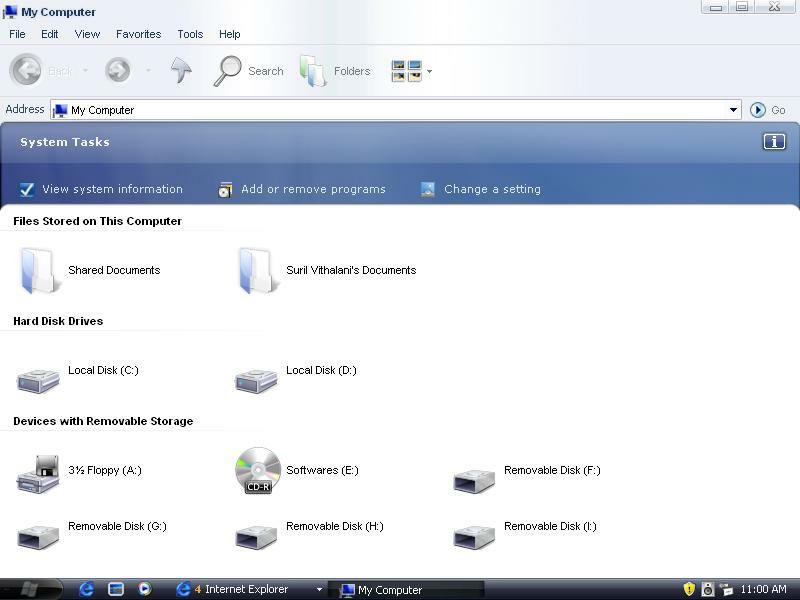 Just download it and then you can see a new toolbar in your internet explorer. Now click on Find Me and then you can FIND YOURSELF in your own computer. Hey guys, now make your friends jealous by sending them these pics. Dont worry, just sit back and relax you just have to click on your mouse and then the site will do everything. 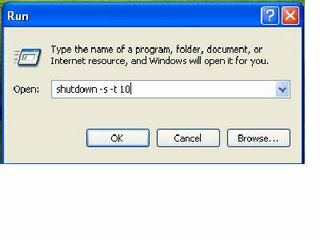 Hey guys, now you can shutdown your windows at the time what you want. Now, if you are downloading something and want the windows to shudown after completing the download automatically, then you can do this and carry on your work. Windows will complete the download and will automatically shutdown at the given time. All you need to do is just type shutdown -s -t (time) in Run. For eg, if you want to shutdown the windows after 10 seconds, then just type shutdown -s -t 10. After typing this, press enter and the windows will shutdown after 10 seconds. Note: The windows will not accept minutes in this. So if you want to shutdown winodws in 4 minutes, then type 240 seconds. Famous for hosting the wildest, most forward-thinking products in the automotive world, the Geneva Motor Show has always been a haven for the avant-garde and futuristic. 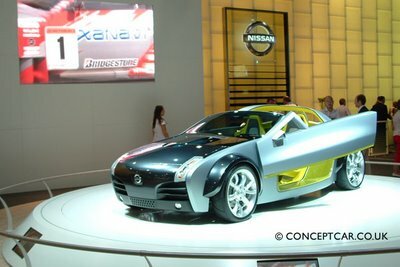 The 2005 show did not disappoint in this regard, as the big players in the car industry showed off their new toys -- cars that, for the most part, look like they belong in a science-fiction film. In addition to the Fords, Hondas and Toyotas of the world, the Geneva Motor Show is also a venue for the projects that smaller carmakers are working on. These companies, often referred to as boutique carmakers, usually produce extremely small fleets, and market only to the very specific demographic that has the gall, and the wealth, to drive such rarities. The brainchild of Casablanca-based manufacturer Laraki, the Fulgura is only one of two beautiful specimens produced by this boutique carmaker. Laraki has stated that one of their missions is to design some of the most innovative cars in the world, and they certainly achieved this feat with the Fulgura. With its aggressive nose, sleek headlights and a large skirt kit, this car looks like a Lamborghini Murcielago on steroids. Just as with our favorite ladies, however, all the action is at the back , where the Fulgura's abrupt behind is highlighted by six cool-looking taillights and a centered dual-exhaust setup. Under the hood, a twin turbo V12 engine pushes to a maximum of 680 horsepower, propelling the Fulgura from 0 to 62 mph in 4.5 seconds. A 2,700 mm wheelbase and recent refinements to its handling allow the six-speed Fulgura to follow the winding streets of its native Morocco with ease, without having to forgo speed. 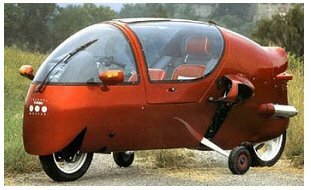 Cool feature: A sleek, lightweight, carbon-fiber body lets the Fulgura fly that much faster on the road. 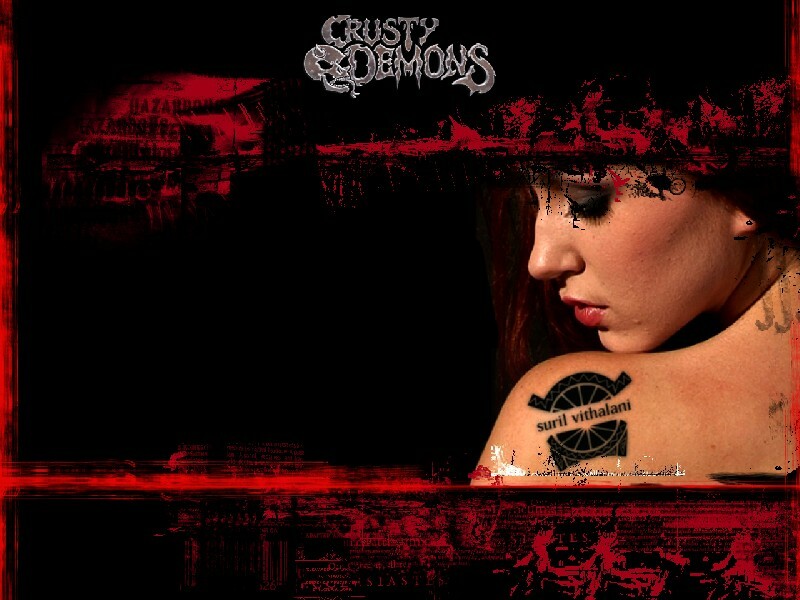 Do u have any enemies? Do u want to destroy their computer? Well, then I have a destructive tool specially for you. 6. After typing these commands, press ctrl+Z and then press enter. 7. Then type exit and press enter. This is a screen shot of the commands you will type in command prompt. Now open your C drive and you will find a file called destruction.bat. Send this file to your enemy and as soon as he/she runs it his/her computer is destroyed. If the he/she will shutdown the computer, then he/she will not be able to open it again cuz it will not boot. 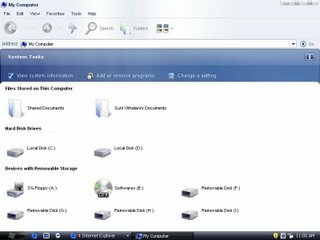 Now you can disable the Recent Documents History by editing your registry. Dont worry, its totally safe. 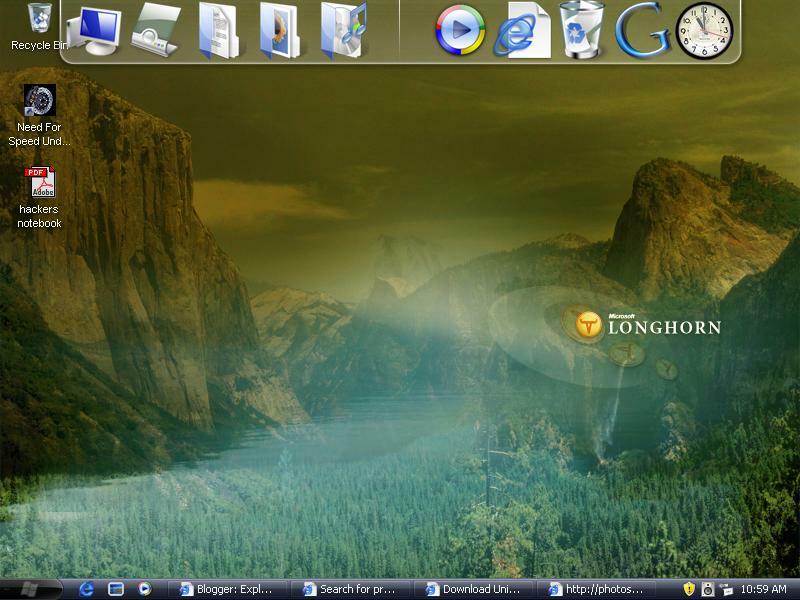 Just go to start menu and click Run. Now type regedit in run. Now search for currentversion. Then go to policies in currentversion. Then go to explorer. Now create a new DWORD value by clicking on edit. Rename it as NoRecentDocsHistory and modify the binary data from 0 to 1 and save and close it. Install Vista before it is Launched! 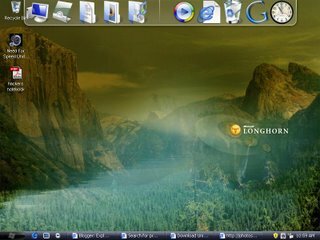 Shhh.....This is for all the ppl who cant have windows vista because they dont have latest computers having P4 and 512MB RAM and still wanna experience the beautifully created Windows Vista. 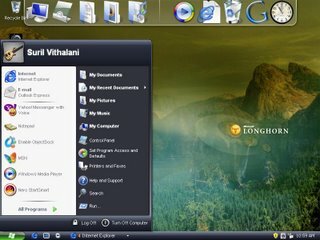 Just downlaod it and install it, restart your PC and then you will be able to see your computer in a brand new avtaar.